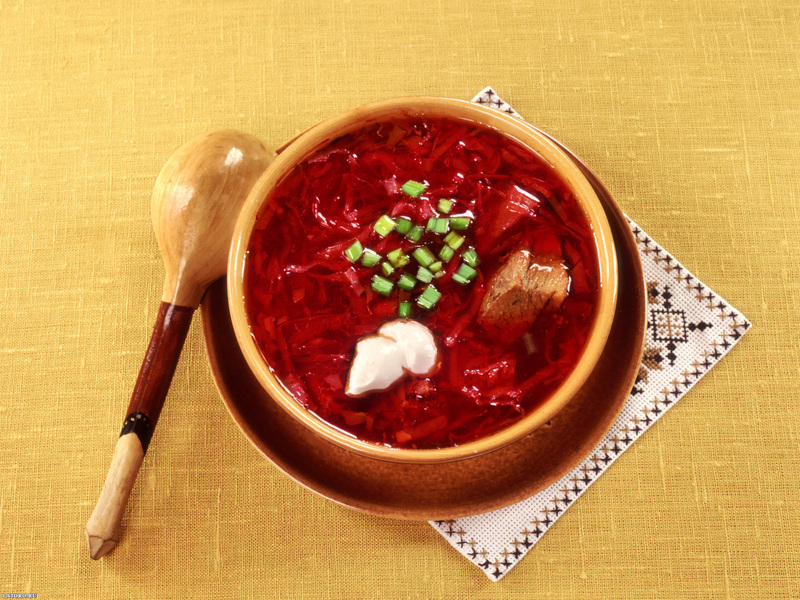 Russian food is hearty, delicious, exciting and very satisfying! I come from Armenia so I grew up with many Russian dishes and can cook them at home. 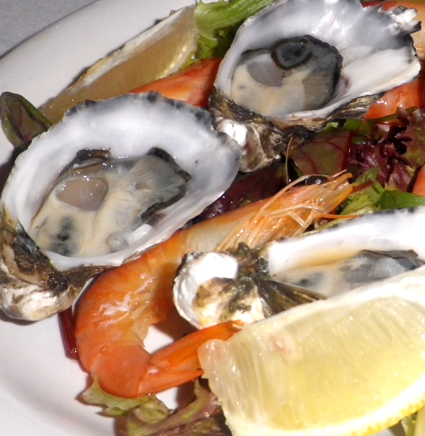 Recently I was lucky enough to go to a few Russian restaurants in Melbourne, Australia and I was pleasantly surprised with the food and the friendly atmosphere with beautiful interior decor and live music on Saturday nights. I visited St Petersburg in Ripponlea (you have to go up the staircase, no lift) and Matrioshka in Carnegie (larger place and on ground floor). Menus are very similar and the entertainment is wonderful, my family and friends danced to many popular Russian, English, Armenian and Jewish songs! 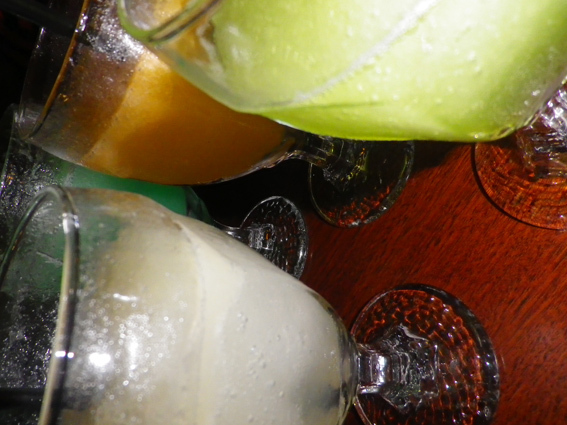 And you can bring your own drinks, no corkage charges! 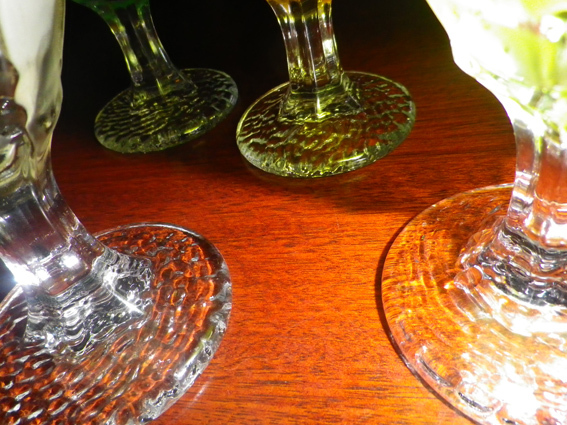 When we arrived to both restaurants, all the tables were already set and the cold appetisers were served on the tables. As we sat down and started to fill our plates with wonderful food, we didn’t talk much because we were enjoying every mouthful! 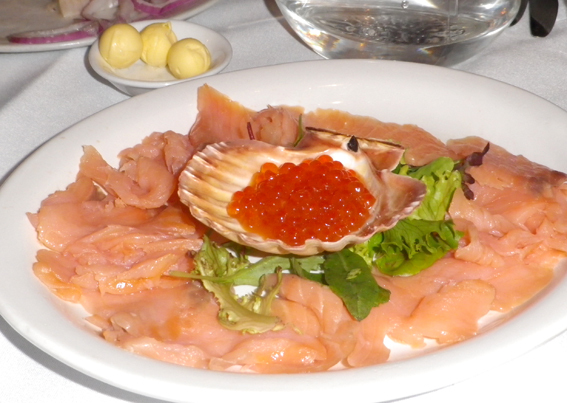 We got to enjoy Russian delicacy- red caviar, which was served in a scallop shell, surrounded by smoked salmon slices, with some butter and a bread roll or pancakes. A creative way to serve caviar! 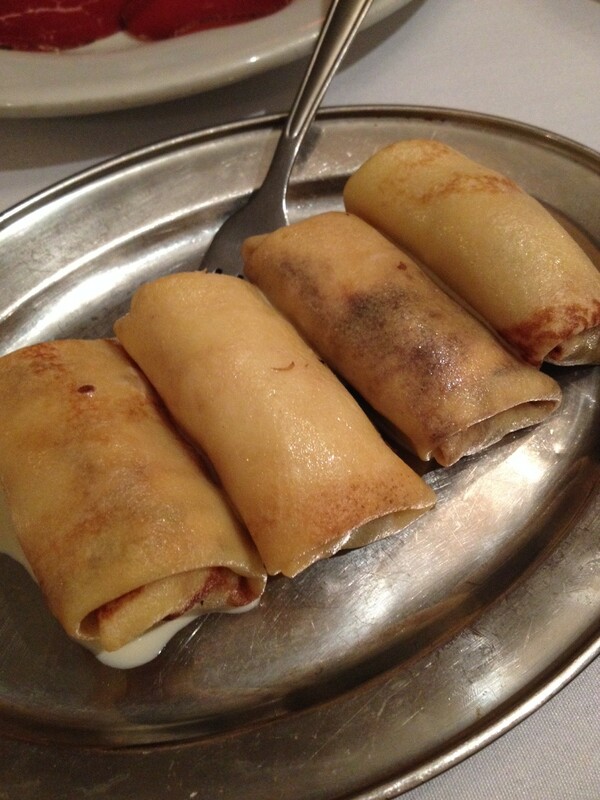 Blini/ Blinchiki/ Blintzes or simply Russian pancakes can be stuffed with any filling and rolled up. Most common stuffing includes any cooked mince meat with fried onions, potatoes with fried onion and some herbs; ricotta; fried cabbage; fried diced mushrooms. 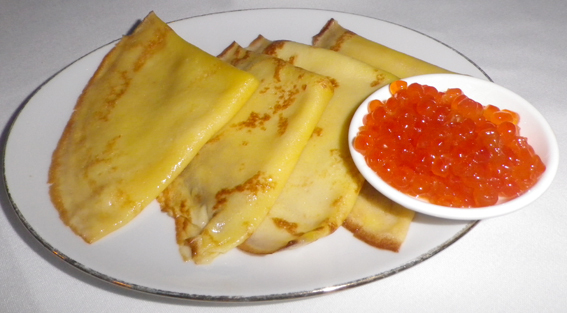 Alternatively, blini can be served flat or folded and served with sour cream, jam, ricotta (tvorog), honey or savoury food like caviar, smoked salmon, salami, etc. 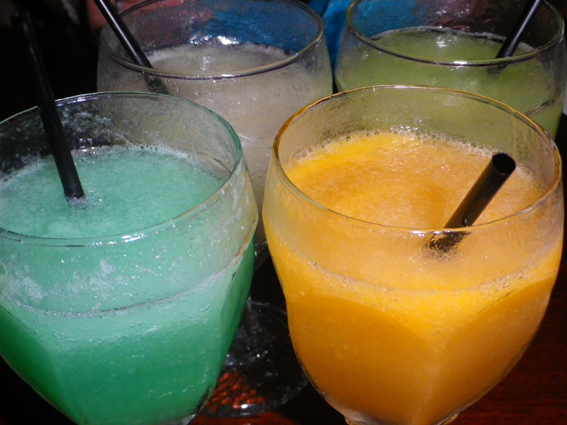 Russian people love Vodka, which is a very strong alcoholic drink! 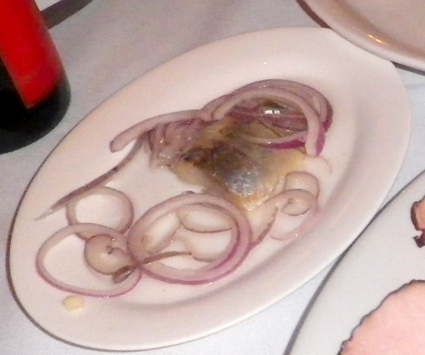 Herring (Selyodka) is a popular choice to accompany Vodka and is served with some onions and cooked potatoes with garlic and melted butter seasoned with fresh dill. 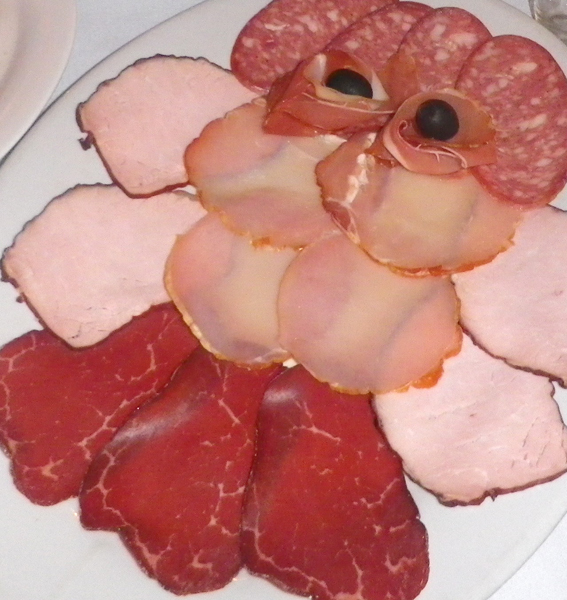 Marinated mushrooms, pickled tomatoes, dill cucumbers, cabbage and cold meat assortments like smoked chicken breast, beef pastrami, turkey breast pastrami, salami- all tasted great! This is a staple dish for any special occasion in Russia and New Year celebrations cannot be imagined without this salad. The original version of this salad was invented in 1860s by Lucien Olivier, the chef of the Hermitage restaurant, one of the most celebrated Moscow restaurants. 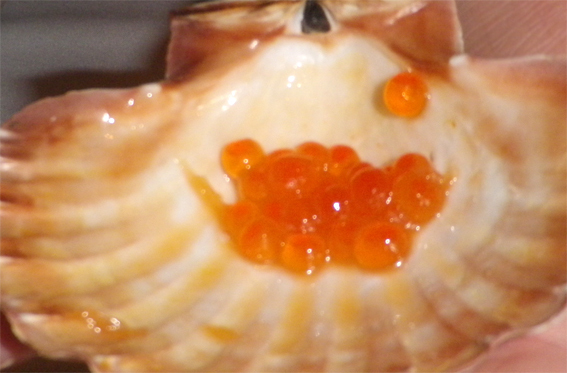 It soon became a signature dish and its popularity quickly spread. 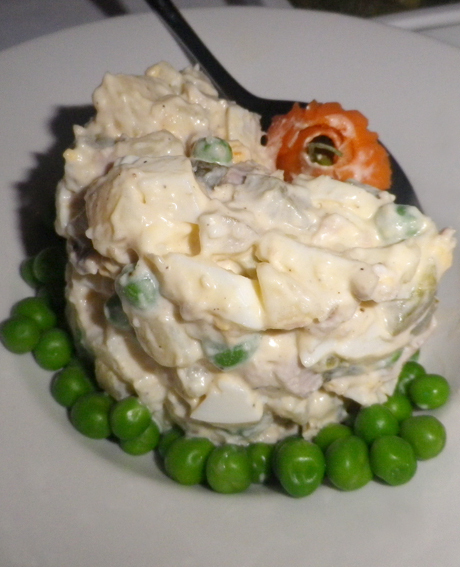 It is known as the “Russian salad” in the Western world. 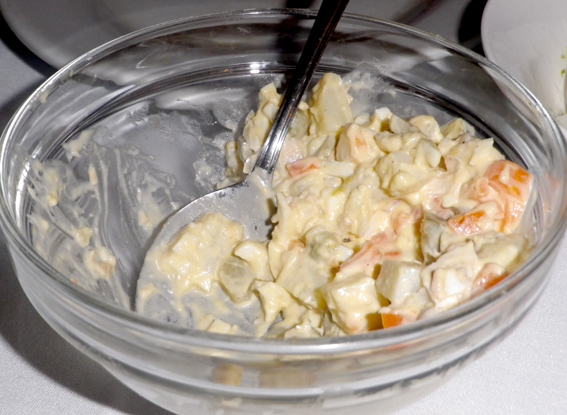 In Russia it is often called Stolichniy (city) salad as well. There are many recipes and every household has their version. 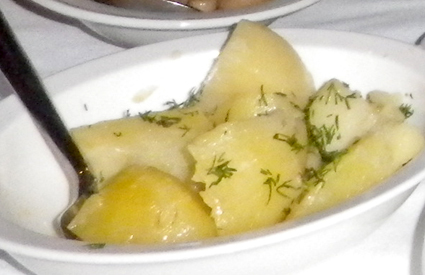 The ingredients include- cooked and diced potatoes, eggs, chicken (or sausage, or meat), dill pickled cucumbers, onions, parsley, green peas, carrots, mayonnaise, salt and pepper. This is an easy salad to make and enjoy- cook and chop everything and add a tasty mayo- voila! We ate every bit of this delicious Olivier! 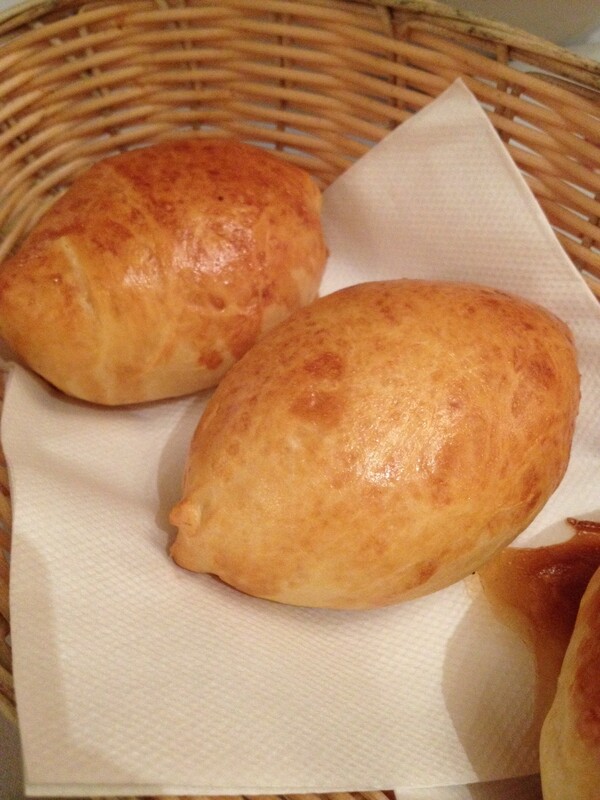 What can I say, Piroshki is my favourite Russian dish which evokes memories and sweetness of childhood! Fresh, hot and cold Piroshki have the smell and the taste to die for! This is a very popular street food item and babushkas (grandmothers) like to spoil their grandkids with this dish! 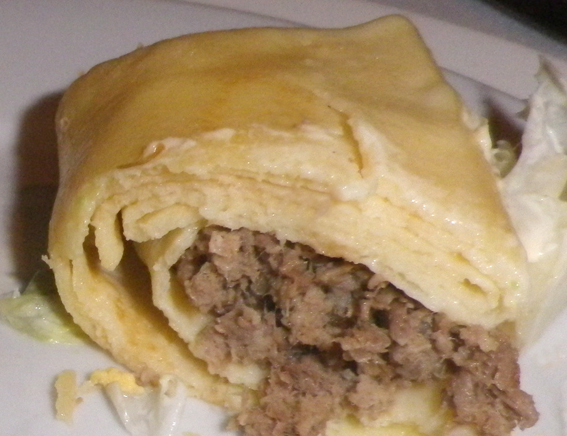 There are fried and baked varieties and stuffing also differs just like with Blintzes (See above). 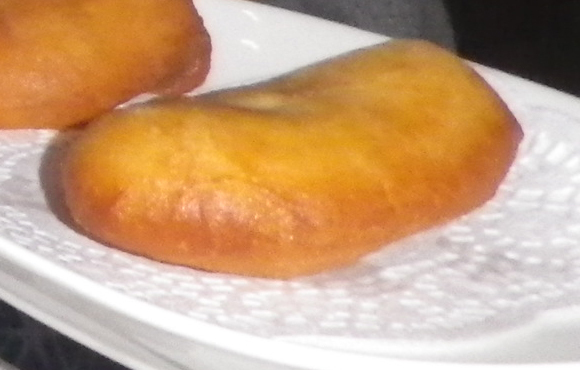 Deep fried Piroshi, we got some stuffed with potatoes and others with mince beef! 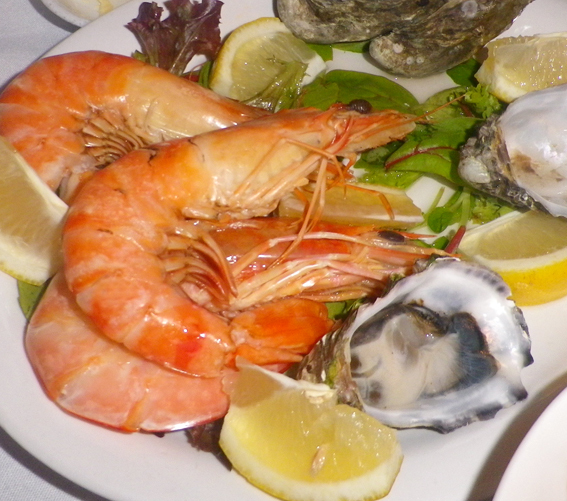 Seafood is also served in the Russian restaurants, both Matrioshka and St Petersburg offered a seafood platter for us but the servings were quite small. I guess, when you are dancing and having a great time, it doesn’t really matter! 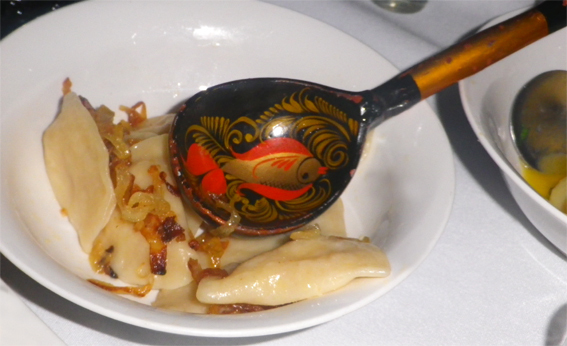 Vareniki are Ukrainian style potato dumplings, stuffed with potato mash were served with fried onion and sour cream! Check out the beautiful spoon! 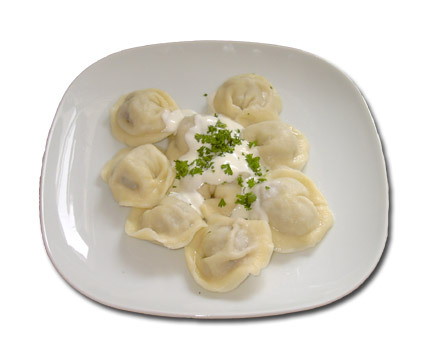 We got the Siberian origin dumplings, but many regions in Russia have their version of this traditional and popular dish of a tasty meat filling wrapped in thin dough and cooked in salted water. 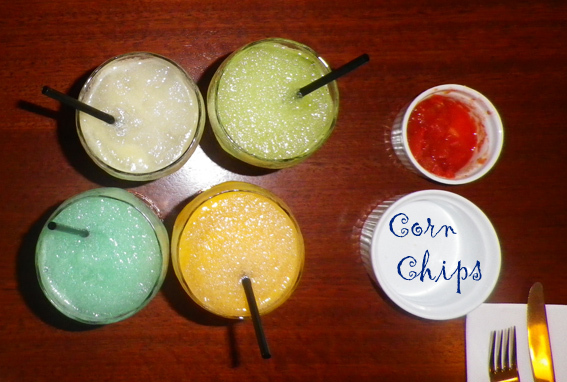 It was served to us with some melted butter poured over with a dash of vinegar. 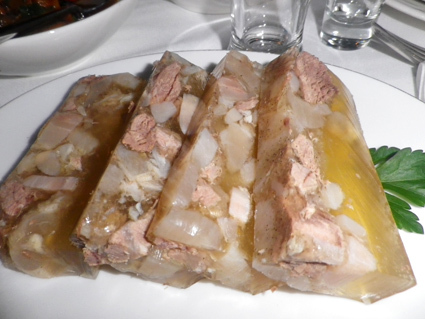 Cholodetz – traditional Russian meat jelly, eaten cold and goes well with wine and vodka! Absolutely delicious roasted eggplants, red onions, carrots and capsicum in tomato sauce with garlic, coriander, herbs and spices. My mum was reminded of her mother’s cooking! This is always a great feeling! To be honest with you, we could hardly concentrate on the food while the talented performers sang the popular songs. We would eat something and rush to the dancefloor. We were dancing and enjoying ourselves. Luckily the singers took some breaks and we returned to the tables to enjoy yet more new dishes! 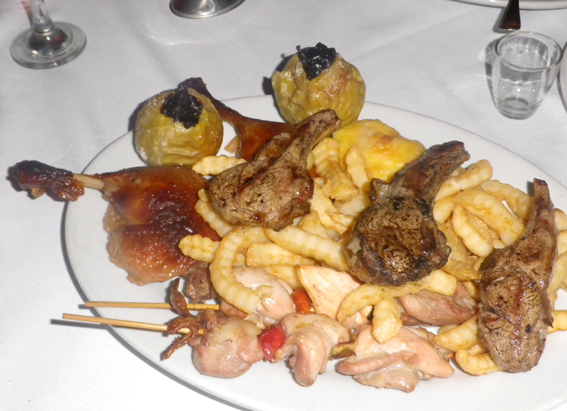 The meat platter arrived and didn’t disappoint, although the portions were small, we could have easily eaten more! What you see on that platter includes-Duck legs baked in plum sauce served with sweet, baked granny smith apples stuffed with prunes; Chicken Kuriniye Shashliki skewers, Lamb Baraniye Cutlets, marinated and grilled to perfection and potato fries. 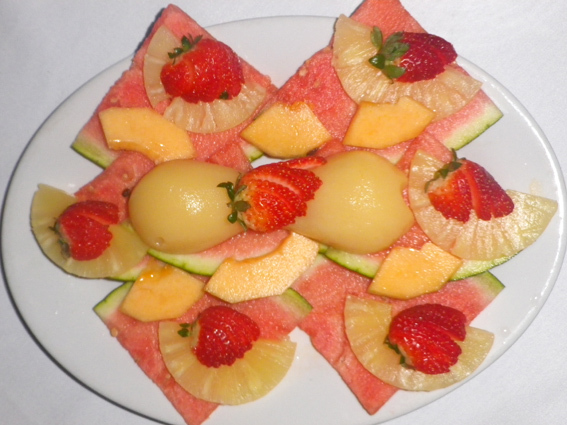 We finished the night on a high with more dancing and a refreshing fruit platter. What a pleasure for the eye! Hope you can visit your local Russian restaurants, enjoy the wonderful atmosphere and food. If you would like to learn to cook Russian food, check out this website, for simple and helpful instructions. Good luck!